One of my favorite things to write about is tea history. 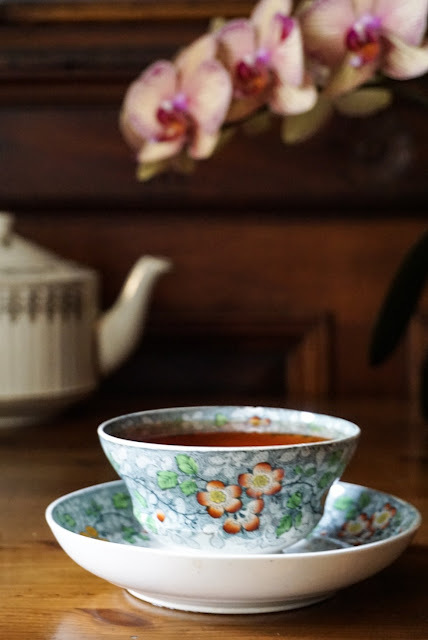 I love immersing myself in the traditions and and culture of tea, especially teaware. I get completely swept up in imagining what drinking tea was like during various time periods. 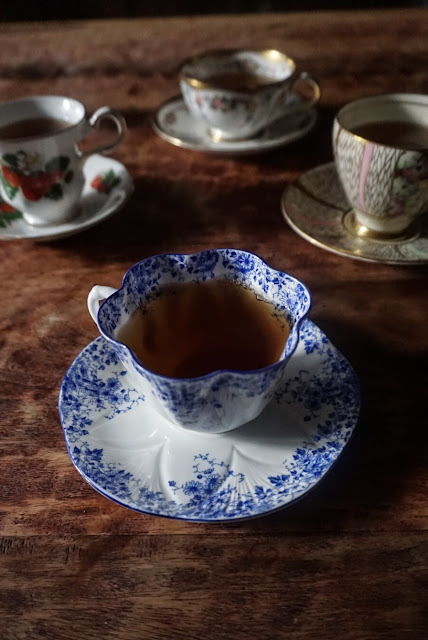 Recently, friend and fellow blogger Lynn Karegeannes reached out to see if I could write a few panels for a tea exhibit she's helping to curate at the Smith-McDowell House Museum, a historic house in Asheville, North Carolina. The exhibit is titled Infused In History: A Tea Exhibit. Beginning April 24, come to the Smith-McDowell House and add TEA to your TOUR! Each of our exhibit rooms will feature tea-related items and educational panels about the history, use and practice of taking tea. We have searched our collection and will have some ‘new’ treasures to display as well as some ‘on loan’ items of interest. Lynn asked if I would contribute two panels for the exhibit, and I decided to write one on the history of European porcelain and the Meissen factory, and another on the development of handles on tea cups. Bruce Richardson of Elmwood Inn Fine Teas is the historical consultant for the exhibit, and it was so exciting to have him read my panels. I've posted about the history of teacup handles before, so I thought I'd write a little bit about what I learned about European porcelain, perhaps to spark your interest in the exhibit. I thought the origin of the word 'porcelain' itself was quite interesting. The word was first used by explorer Marco Polo, who encountered the material while traveling through China. The delicate, material reminded Polo of a seashell, and so he described it using the Portuguese term porcellana, a type of cowrie shell. As I've mentioned in previous posts, Europe was crazy for the porcelain teaware exported from China starting in the 1700s, and many artisans and entrepreneurs were desperately trying to recreate the material without much success. But with the amount of teaware Europeans required, it was crucial to find a way of manufacturing it closer to home. So, when did Europe finally discover the 'white gold'? German alchemist Johann Friedrich Böttger is credited as discovering a formula for hard-paste porcelain in 1708. Böttger was originally trying to create gold (he was an alchemist, after all) when he attracted the attention of Augustus the Strong, the gold-hungry Elector of Saxony and ruler of Poland. Augustus ended up imprisoning Böttger in the hopes of forcing him to create gold, but through his experiments Böttger ended up making porcelain instead. It’s difficult to pinpoint which manufacturer started creating porcelain first, but in 1710 Böttger’s discovery led Augustus The Strong to establish the Meissen factory in Germany, which became the first to manufacture porcelain in large quantities and unrivaled quality. If you're as crazy for teaware history as I am, I hope you can check out the exhibit! Please do report back if you get there, and let me know what you think. Be sure to check out Lynn's blog to learn even more about this exhibit. Also have a look at the calendar of events for the exhibit, as there are some interesting things happening, including a lecture by Bruce Richardson. If I lived closer, I'd be in the front row! 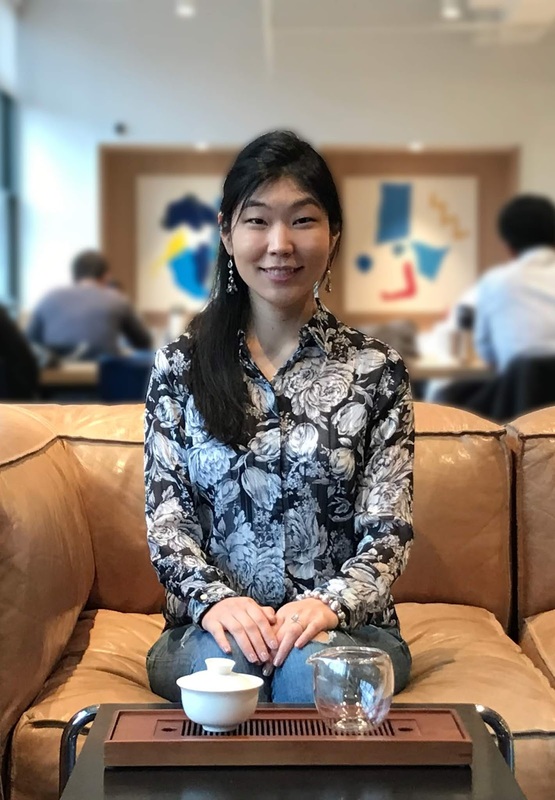 I recently had the chance to meet Ashley Lim, Founder of Mansa Tea after sampling a few of her pu'er teas. Her story was quite intriguing and she kindly agreed to an interview. 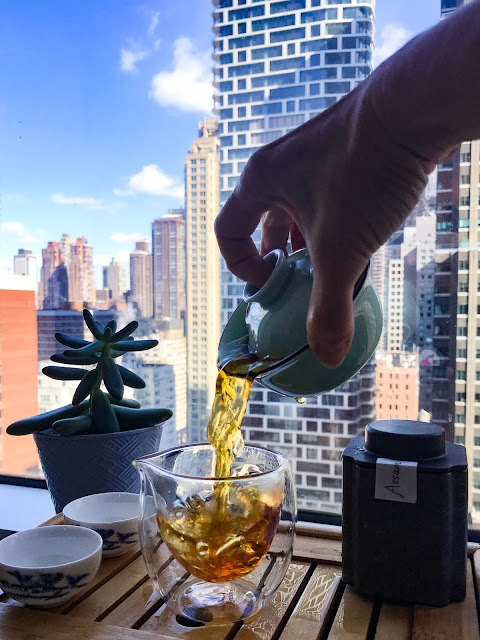 Learn all about how growing up in a family of tea enthusiasts has shaped her love of tea, and continues to influence her company, below. Every photo I saw when we were studying, every story I heard during our discussion was like a wakening for me that the love of tea is truly universal through time, in spite of all the schemed plays in the history. So once for a while, why not have a nice cup of tea, in the English way, clotted cream, marmelade, scones, with some friends, old and new. This is delightful in our life. My experience with tea occurred while sitting at my grandparent's kitchen table, listening to the grown-ups talk about grown-up things. I was very close to my grandparents, visiting them about once a week. During those visits we often ended up with cups of tea and conversation. As a very young child I hated sitting still, forced to listen to the adults chat while they sipped mugs of hot tea. I wasn't usually offered tea at that age, but I did manage to sneak a sugar cube or two from an old chrome sugar caddy; the coveted prize dissolving on my tongue while I pretended there was nothing in my mouth. The sugar canister now sits on my kitchen shelf as a bittersweet reminder of precious memories. Even though I didn't have much to add to the adult conversation, the ritual of taking tea with my family was lovingly etched in my mind. Just as it was back then, it's a moment to pause the day, share with loved ones, and enjoy a few special moments together. 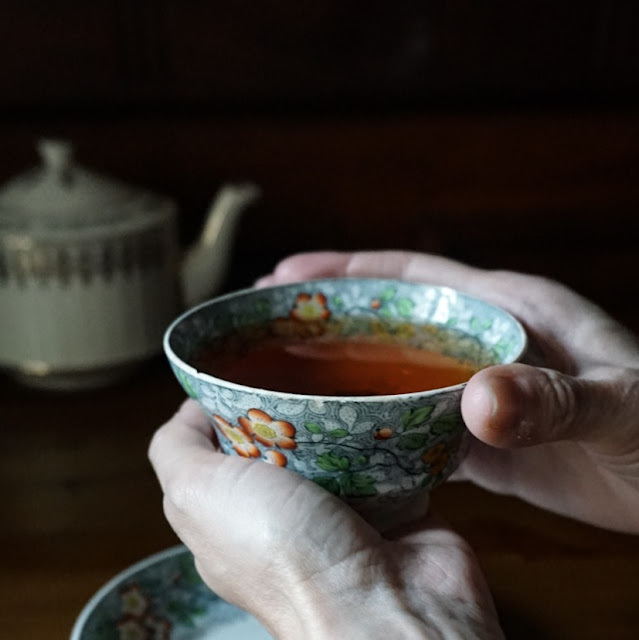 My love and knowledge for tea has grown since the days of stealing sugar cubes from my grandparents' table, but it remains a deeply personal experience. I try to savor every cup I make each and every day. I love sharing tea with family, friends, and co-workers, and capturing those moments on the blog. One of the most pleasurable memories of tea is the ritual that formed around it, a purely personal family ritual, involving my mother or me saying, after we’d finished dinner, and my father had left the table and the dishes had been done, ‘would you like some tea?’ This was back in the 60’s so after one of us boiled the water, we whipped out a tea bag of some kind and poured the water directly into our small mugs, over the bags. (people did use loose tea in those days, with a vengeance in fact, with tea balls or strainers, but this was the suburbs, and it seemed, tea balls hadn’t made their way to these parts yet) We always added a dollop of whole milk. Mum was from Canada and had inherited this British custom. And the way some people’s hearts and souls and mouths are lubricated with alcohol, ours was with tea. It seemed to warm and loosen our innermost thoughts and feelings. We would talk, just the two of us, about almost whatever we were thinking about — often for over an hour. The content of our conversations has blurred over these many years, but I remember how trusting, full of humor, and laughter, these tea-times were. Tea has become the constant in my daily life, however, it still remains a special ritual that I hold near and dear to my heart. The best way that I can express tea's meaning in my life is via the Japanese idiom, Ichi-go ichi-e, which translates to "for this time only" as it describes respecting a truly unique and unrepeatable moment. I treasure each tea leaf and understand how precious every sip is, as it reflects the terroir of the land where it was grown and yet becomes immersed into that very second where I am steeping it in my world (am I am home curled up by the kettle on a wintry day or listening to the spring birds sing beyond the sunny open window). I am grateful that tea carries such special meaning in my life, with the ability to anchor a moment and ground me in the present to truly be appreciative. When I was living in London tea was part of my daily life. Black tea with some milk (no sugar) always makes things look better. If you feel down "a cup o' tea" will take the worries away. And the secret? It's the best cure for hangovers!! Tea has been a part of my life for as long as I can remember. It started with sharing milky, sweet mugs of Red Rose before bed. I treasured the time spent with my mother and it made me feel a bit more grown up. I also loved collecting the little figurines that came in each box of teabags. My early love for tea turned into a real passion during my college years. That road led me to start my blog and to work in several tea shops over the years. Since then tea has been a connective force in my life, opening doors to new experiences and meeting new people from across the world. The leaf of this unique Asian tree strengthens our systems and balances our processes, enhances our days with soothing and stimulation, and improves our lives through cure and invigoration like no other. For me the ultimate tea experiences are those rare moments when we manage to summon all our focus. We block out the distractions of intellectual preconception, ignore our knowledge of region, manufacture and cultivar. 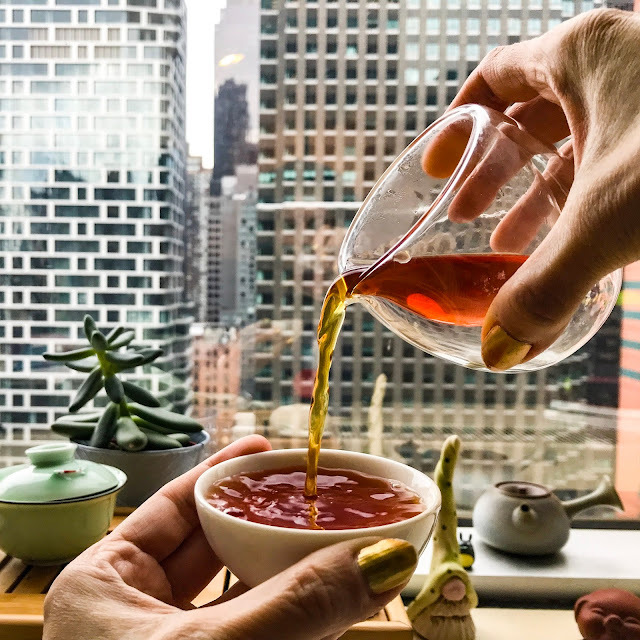 We separate all that noise and centre in on the sensorial experience of the tea’s chemistry as it stimulates our senses, becoming completely immersed in the visceral effects of the mouthfeel, the body feel and the inner world of the flavour-profile. A precious connection with the essence of this fabulous plant. All of the comments seem to revel in the magical feelings tea brings them, and those they share it with. I love how everyone had a different perspective but their love for tea is a common bond. I could go on and on, asking everyone I know what tea means to them, but I'd have a blog post the size of a novel (hmm...). I'm thinking of at least doing one more installment of this series, as there are many more people I'd love to ask. It's tea cocktail time! Have you heard of an oolong hai? It's a deliciously refreshing Japanese tea cocktail that is super simple to make. You just need three ingredients- cold oolong tea, shochu, and ice. What Is An Oolong Hai Tea Cocktail? Oolong hai is a drink popular at izakaya restaurants and karaoke bars in Japan. I've had it at a few local Japanese places here in NY, and I just love the earthy, refreshing flavor. I'm imagining sitting out on our little patio in the springtime, listening to the birds and sipping an oolong hai. The drink is called a 'hai', because it's short for 'highball'. A highball is basically whiskey with a mixer. 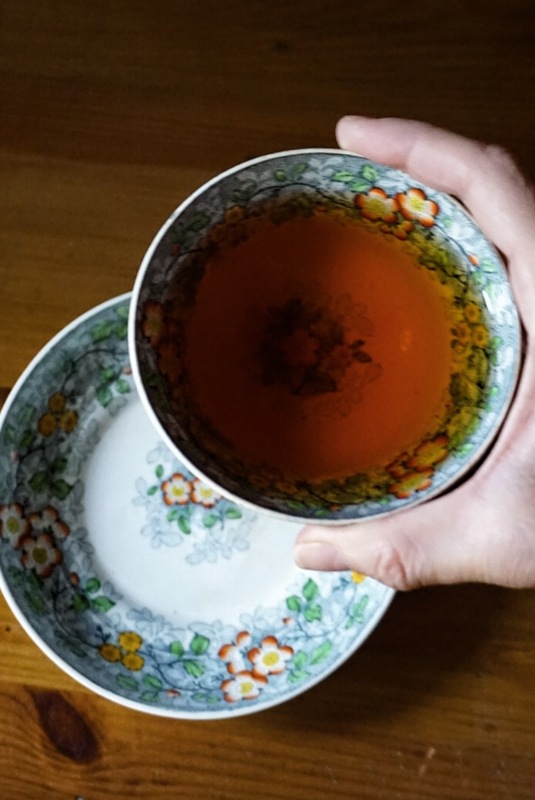 The oolong hai is reminiscent of the original drink, with an interesting spin using shochu and tea. I find the oolong hai to be a bit more delicate than a highball. Depending on the variety of shochu you use the drink can be quite subtle, allowing the oolong tea to shine through. First, let's talk about the shochu. Shochu is a Japanese distilled liquor, usually made from sweet potato (imo), barley (mugi), or rice (kome). Each one has a different flavor, which will slightly change the overall flavor profile of your cocktail. Finding shochu may not be as simple as going to the liquor store. You may need to call around to see which store near you carries it. I had to visit a few stores until I found one that had it (I should have called ahead!). But you can also order it online, and as with any other liquor there are different grades and price points. Of course, you'll also need an oolong tea. From everything I've seen, a medium to heavier-oxidized/roasted oolong is a good choice. I wouldn't use anything floral here, but you could certainly try one and see how it works. I decided to use a Muzha Tieguanyin for my cocktail, mainly because I had it in the house. Dong ding would work nicely too, whatever darker oolong you've got. I like to do a cold brewed tea, but if you don't want to wait, you can brew the tea to double strength and ice it. The recipe is super simple! The basic recipe is six parts tea to four parts shochu. Fill a highball glass with ice. Pour over 120ml of shochu, then add 180ml of tea. Stir and enjoy! 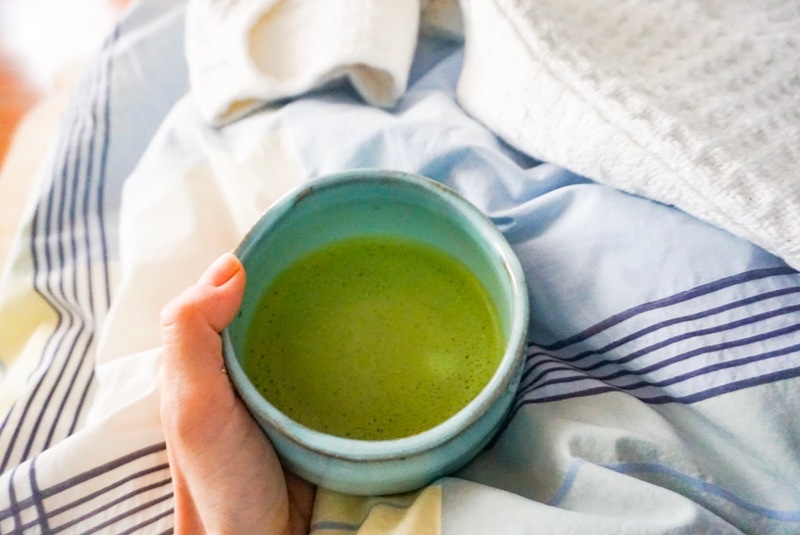 If you feel like changing out the type of tea, you can make a sencha hai, which is also a popular drink and I'm sure it would be just as refreshing. I keep thinking hojicha would be a delicious substitution, which I'm going to try next! If you'd like this to be closer to a classic highball you can add a fizzy component such as club soda or even ginger ale. A squeeze of lemon would also make it a nice summertime drink. It can be tailored to whatever flavors you feel like adding, since the shochu is so subtle. Have you encountered any other interesting oolong hai cocktails? I'd love to hear your experience with them. Kanpai! Why Does This Tea Taste Bad? If you've only had tea that tasted too bitter, or flavorless, or musty, it doesn't mean you don't like tea. It could just mean you're not tasting the tea in the way it was intended! 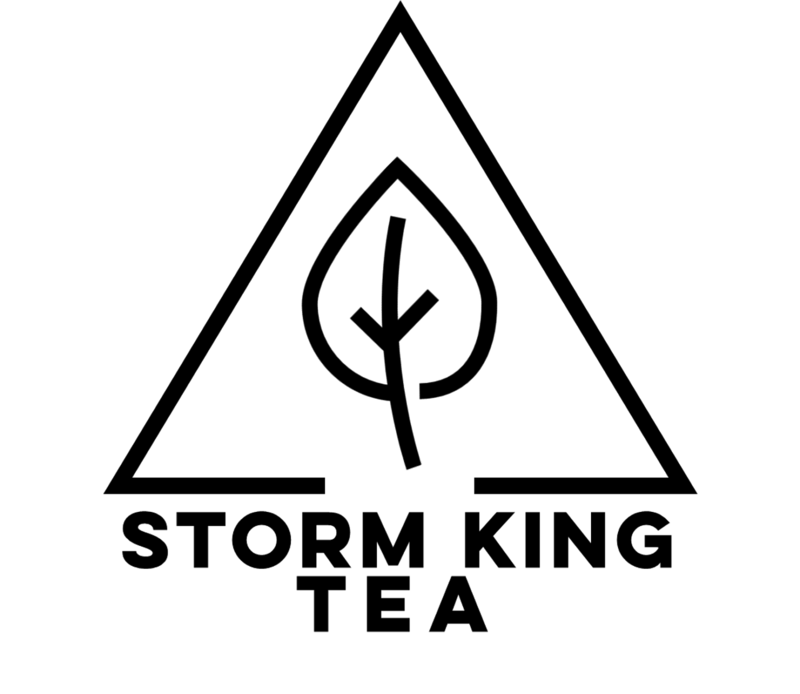 Every type of tea is different, and several factors can lead to creating a bad cup. The other night I had yet another bad tea experience at a restaurant, and it inspired me to write this post. The tea in question should have been vegetal and lovely, and instead I had something bitter and too astringent. Thankfully I knew the tea wasn't bad, it was just prepared incorrectly. It doesn't matter if you're preparing the tea yourself, or if you're at a 4-star restaurant; if a tea is prepared incorrectly, it won't be at its best. So why does your tea taste bad? Important factors such as the amount of leaf, steeping time, temperature, and quality will greatly change the flavor of your tea. I'm lucky to live in the NYC area, and our tap water tastes great! It really does. I usually use filtered tap water for my tea. But when I travel to visit relatives upstate, I cannot use tap water to brew my tea, filtered or not. It tastes awful! So consider your tap water, and if that could be altering the taste. I'd suggest trying filtered tap water first, and also experimenting with bottled water to see if the flavor of your tea changes. If you'd like to read a little more about how water changes the flavor of tea, check out this great post by Rie from TeaCurious. This seems to play a role in many restaurants. It's so important to tailor the temperature of the water to type of tea you're making. A delicate green tea isn't going to react well to boiling water, and a strong black tea may taste bland with water that's not hot enough. I've noticed most restaurants don't take the time to control water temperature. For example, when the water is too hot, green tea basically gets scorched and the tea turns bitter. You'll miss all the amazing flavors that a lower temperature can coax out of the leaves. Be sure to consult the packaging of your tea, it'll most likely indicate the temperature you should be using. Or a quick online search will tell you what you need to do. This is another culprit of bad restaurant tea. I've been served pots of tea with an infuser filled to the top with leaves. In most cases, if you use too much tea and not enough water you're going to get a puckering, astringent, undrinkable brew. And of course, if you aren't using enough tea in a huge pot of water, you won't get much flavor. It also depends on your brewing style, but for Western brewing (in a teapot or mug with an infuser), be sure to consult the packaging. A typical ratio is usually a teaspoon of tea to a cup of water, but that's not an exact science and it greatly depends on the leaves. I'm guilty of over-steeping my tea most days when I'm at work. I'll start a steep, and proceed to check emails, get distracted, you know the deal. I really should be setting a timer (I use the timer on my phone) to remind myself. Over or under-steeping a tea will cause the flavor to be too strong, or obviously too mild and both will negate any nuances in the tea. Are You Using A Tea bag? Ok, first off, I'm not saying tea bags are bad. They're not! There are many good ones on the market, with quality tea inside. But many tea bags are just tea dust or very low quality leaves, which renders the brew unpleasant and flavorless. Another issue is the taste of the tea bag itself- you can easily be getting paper or even plastic notes in your tea. Definitely not tasty. It's possible you're also using tea that is quite old and wasn't stored properly so it's turned stale. That'll make your tea taste, well, stale. Or perhaps you stored the tea next to something quite odiferous, and it's taken on the less-than-pleasant smell. Tea also varies greatly in quality so I'd suggest trying other brands of the same tea type, you may find one you like better. Doing just a little bit of research about a tea will help you determine if you have something you don't like, or just a poor version of it. So, now you have the knowledge, but maybe you need a few things to get started. A variable electric kettle is a great way to control the temperature of the water. I've owned this one in the past, and it works really well. I also love this one. I've been drooling over this one for months (what, doesn't everyone drool over electric kettles?? ), and hope to acquire it at some point! A pitcher with a water filter is a handy way to improve the flavor of your tea. To measure your tea, you can use a teaspoon, but to be even more precise, a small kitchen scale is essential. I mainly only use mine when I'm tasting a tea for review or trying one for the first time, but if you use it you'll get the right amount of tea every time. For Western-style brewing, be sure to have a teapot with a mesh strainer so you can remove the leaves at the proper time. There are hundreds to choose from but I love these cute little teapots, they are great for home or office steeping. So, what do you think? Don't dismiss a particular tea (or all teas!) just because you didn't like it the first time. Of course it's possible it's just not for you, but give tea a chance, and make sure all of these important variables are correct. Chances are you'll have a much better cup of tea. There are so many types to try, so don't give up! 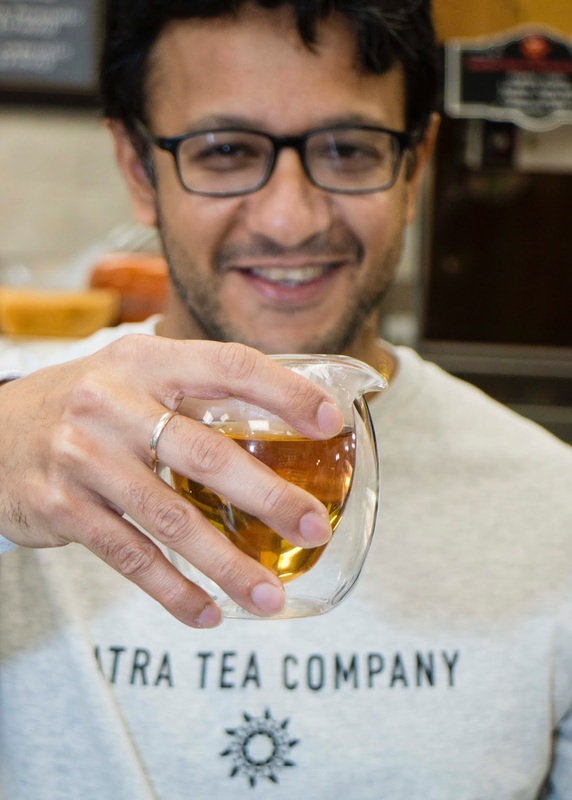 I'm pleased to present my interview with Vikram Mathur, owner of Yatra Tea Company. I first had the opportunity to try Yatra tea at the 2018 World Tea Expo, where I assisted with a tea pairing workshop. I enjoyed the teas I tried, and I was curious to learn more about the company. I recently connected with Vikram, and he graciously offered to answer a few questions. Learn about his tea journey, how he is helping the Indian tea growing community, and what inspires him in the interview below.